New Michael Crichton Novel Slated for November Release? Harper Collins, the publisher of Crichton’s novels Prey, State of Fear, Next, and Pirate Latitudes, has listed Untitled Crichton Novel in their catalog. These are also listings for audio, large print, and digital editions. I’m wondering as well. And I’m also wondering if this is the novel Crichton left unfinished at his death, or is another work that, like Pirate Latitudes, was found on his computer. A US federal appeals court is hearing a case about the legality of gene patents. The case, Association for Molecular Pathology v. U.S. Patent and Trademark Office, concerns the right of Myriad Genetics Inc. to patent two genes associated with breast cancer. Oral arguments can be heard on the Appeals Court website. The ACLU, one of the plaintiffs in the case, has court documents for the case on their website. On March 29, 2010, a district court judge ruled that seven patents held by Myriad Genetics were invalid. 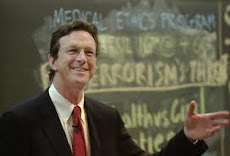 Michael Crichton stated his opposition to gene patents in the Author's Note of his novel Next. Thank you, John, for informing me of this.